Dylan: Well, you've had the benefit of a more diverse exposure. Maybe you can share your experiences with her. That non-Nietzchians aren't inferior. Tyr: You want me to lie? With this release from ADV, Andromeda ends its inaugural season in pretty much the same place it began. The premise promised a different kind of sci-fi show: one that wasn't just episodic adventures, but a continuing quest to establish order in the universe. The show actually turned out to be... just another episodic sci-fi show, full of thinly drawn characters, predictable plots, and lots and lots of explosions. The season finale exhibits a lot of the problems that have irritated me. The plot is basically superfluous, a ten minute set-up before the rest of the episode bogs down into action scene after space battle after gratuitous slow-motion battle. I like the cast, but none of the characters were given much of a chance to grow. Dylan (Sorbo) is still the same guy he was in episode one�apparrently all his efforts to rebuild the Commonwealth have had no lasting effects (and if there is one thing I wish would grow on this show, it's a new haircut for Sorbo). The crew of the Maru�Beka (Ryder), Harper (Woolvett), and Tyr (Cobb)�is barely recognizable as the group of mercenaries they were when the show began (unless, of course, the plot calls for "tension" among the group). And then there is Trance (Bertram), who can be described thusly: cute, mysterious, and pointless. It isn't that I don't enjoy the show. Though I'd make no effort to actually watch it in broadcast, with commercial interruptions, it's rarely boring. But is it really worth paying $10 per episode to own on DVD? I generally want a little more for my money. This set collects the final four episodes of Season One on two DVDs. Dylan strikes a deal with two warring Nietzchian tribes�if he gives a woman from one a ride to the home world of the other, they will agree to let him sign these other, unseen systems into the Commonwealth (whatever, Dylan, like there really is a Commonwealth). Unfortunately, their passenger, Elssbett (Kimberly Huie) isn't so much a blushing bride as she is a brainwashed assassin on a suicide mission. Don't worry; some Sorbo Speechifying will set her straight. As is typical of this show, a strong concept with real world implications is oversimplified and then covered over with a gee-wiz space battle. Tell me again why it is a good thing to have ships with human emotions? Because they cause nothing but problems, if this episode and The Mathematics of Tears are any indication. Rommie (which is the Andromeda android, which is, I guess, different from the ship's A.I., not that it is ever really explained) falls in love with a visiting robot (played by Stargate SG-1's Michael Shanks) who is also an avatar for an artificially intelligent ship. Except his master went crazy and started a terrorist war on the known galaxy. The maudlin romance is counterbalanced by some nice scenes for Rommie, who questions whether a warship can act against its programming. Notable mostly because it was here that Shanks and Doig fell for each other (leading to his exit from SG-1). This is probably the best episode of this volume, but it has its problems. 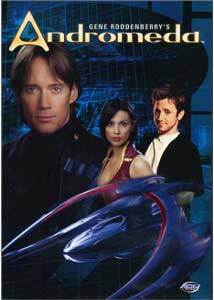 The main story, about the crew's search for a slipstream link to a legendary treasure planet (featuring some nice continuity with a reference to the book Trance and Harper found in Fear and Loathing in the Galaxy), isn't bad. The group stays on the ship the entire time, and there aren't a lot of CGI-intensive battle scenes, nor are there guest stars vying for attention. That means that each character actually gets worthwhile screen time. Unfortunately, Beka's plot involves her sudden addiction to flash, that stuff that made her eyeballs go white in episode 15. In the best Saved By the Bell tradition, she gets addicted, strung-out, and cured all in the space of one episode. She does not, sadly, sing I'm So Excited a l� Jessie Spano. The season finale stuffs ten pounds of gratuitous action into a five pound bag. There is a cool setup, at least�Andromeda's systems go haywire and a long dormant program becomes active. The ship, which has charted a course into hostile space, now sees the crew as invaders (meaning they have to face off with the internal defense system). And just when you start to think, "Hey, all this action is good, but where's the plot?" you get pelted with yet more action, as the ship is overrun with Magog (note now that the internal defense system is not so effective). Cue roughly thirty mindless minutes of fighting and flying yellow sparks before the obligatory, season-ending cliffhanger. Image Transfer Review: Andromeda airs in 4:3, but was shot with high-definition cameras; thus, we can enjoy the show on DVD in 1.78:1 anamorphic widescreen. Colors are nicely saturated, blacks are nice and deep, and shadow detail is very good. The special effects scenes show some shimmer, likely because they were mastered at a low resolution. Audio Transfer Review: The included DD 2.0 mix isn't bad, and presents dialogue well, anchoring it in the center channel with a bit of bleeding into the mains. The wide front soundstage features some nice directionality during space battles and fight scenes, but nothing too impressive. Surrounds stay mute throughout, not even offering enhancement for the score. Extras Review: Once again, the back of the box advertises a commentary (for the episode It Makes a Lovely Light) that is not included on the disc. Twice in a row? It's called quality control, ADV. This volume doubles up on text profiles, offering a few text screens of character backstory and costume sketches, along with brief interviews with actors Gordon Michael Woolvett (Harper) and Laura Bertram (Trance). There is another text bio on disc two, this one for executive producer Adam Haight (I repeat: how many executive producers does this show have?). There is an extensive text section that provides information on engineering, science, and technology, and another glossary that includes pseudo-scientific terms created for the show (S-Z, and we've finally reached the alphabetastic end). Disc two's text extra is entitled Timeline of the Commonwealth: The Long Night. Both discs include deleted scenes, one from Star-Crossed and one from It Makes a Lovely Light. Both also include image galleries�the first, "Technology"; the second, "Prop and Set Concept Drawings." This volume's featurette is On the Set of Andromeda, a short piece that intercuts clips of scenes being filmed with the finished product. There is also another kind of amusing gag reel. It seems like they used up most of the really funny stuff on the first set. Have you seen my force lance? Disc one has promos for the first two episodes, while disc two has promos for the others. ADV previews are also split between the discs; all told, there are clips for Farscape: Season 2, Noir, Zone of the Enders: Idola, Wild Arms, Excel Saga, The Devil Lady, and Samurai X. It will be interesting to see what kind of extras ADV cooks up for the Season Two sets. Much of the material here provided background information about the series, and has run its course (unless they start up another glossary or a different timeline). In addition, most of the "featurettes" were made up of promotional material produced before the series premiered. Nevertheless, the extras were decent throughout the first five volumes, missing commentaries notwithstanding. Andromeda ends its disappointing first season without distinguishing itself as a series. Though it has a good cast and a decent concept, its potential is continuously wasted on recycled Star Trek plots and underwhelming attempts at continuity. On the other hand, the show plays fairly well on DVD, and ADV has done a great job with their pricey releases.